Our mission is to explore and share the mutual relationship between healing plants and human beings. House of Harlequin details one man’s perspective into the world of medicinal cannabis — It’s our master cultivator Wade Laughter’s approach to cultivating medicinal-grade cannabis. It is our intention for this site to serve as a resource for people interested in learning about a different path to cultivating Cannabis, especially CBD-rich Cannabis plants that have shown remarkable results in our collective patients group suffering from a variety of health issues. Wade Laughter is a master cannabis cultivator known for identifying and propagating the high-CBD strain known as Harlequin. In addition to cultivating premium cannabis for nearly two decades, Wade has specialized in CBD-rich cannabis cultivation in Northern California for the last ten years. He is a researcher, speaker and activist about cannabis. Wade also advocates for patients’ access to safe, clean, affordable medicine, while providing cultivators with information on Best Management Practices. Wade was recognized as a master cultivator by High Times Magazine as early as 2008. 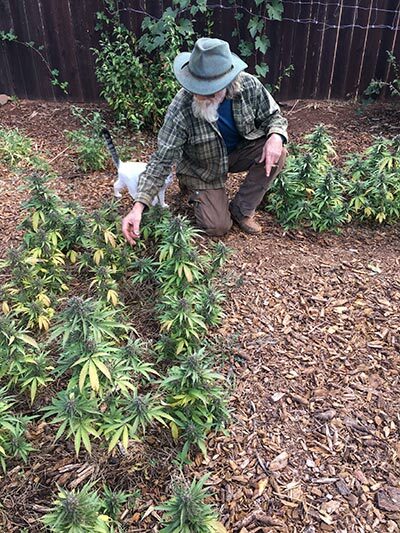 In addition to tending to the garden, Wade also consults with patients who are members of his collective, works on the herb farm or is guest speaking at cannabis panel discussions. Nature has a way of sorting things out. Our job is to let that happen in a way that is of benefit to the entire ecosystem, as well as humans. At House of Harlequin we work with nature, not against it. In an outdoor cultivation setting, the environmental impacts are the least; and the best medicinal plants grow in nature, not in our attempt to duplicate nature. Skillful indoor growers can recreate nature and produce beautiful plant material, but it’s expensive and requires unflagging attention to detail. Medicinal-grade cannabis requires the most impeccable of cultivation standards, and at House of Harlequin we work with nature and the elements to support the plants’ needs with good soil, water and sunshine. There are a number of reasons to approach medicinal-grade cannabis cultivation with the idea of regenerating the garden space and regenerating our lands. Cannabis is a healing plant. Part of the healing process has to do with the practices that you use to help heal the place in which you do those practices, and it’s about reducing the impact of what you are doing. Through techniques that include cover crops, planting companion plants, and using mulches, we can actually rebuild the soil. There’s an environmental impact associated with everything from packaged guano and how that guano is sourced, to the bottled organic nutrients that can be purchased in a store. Any input brought from elsewhere must be impeccably sourced, and ideally, minimized or eliminated altogether. Regenerative agriculture involves being creative and working with the plants needs in a way that can also stop soil erosion, protect the quality of groundwater and reduce fertilizer and pesticide input/runoff. This kind of energy and attention to the cultivation process translates into the quality of the medicine the plant produces. Testing the soil and figuring out what the soil needs before putting plants in is as important as the cultivation cycle. The plants can feel the difference between a soil that is alive and full of mycelium and most commercial potting soils. Cannabis is a bioaccumulator. If a person is going to cultivate plants for their healing aspect, it is not how much you have in the end, but what you have. What you have in the soil is indicative of the quality of the end product. A soil teeming with life will eliminate the need to add excess nutrients. Our experience is with an “attitude of gratitude” toward the plant, we are able to give the plants just water from start to finish. That way, I know there’s nothing on the plant material that could be problematic for the end user (patients). In order to use the end material for medicine, the plants must be grown in a way that is free of any chemicals or heavy metals. We can include compost teas to enrich the soil, but not any kind of foliar spray for feeding, fungicides or pesticides. Because nutrient salts will accumulate in the plant, we amend the soil in the off season so the soil is at its full potential when the plants go in the ground. “I’m simply someone who, for 20 years, has given my full attention to what it is that some plants need in order to flourish. With that information we try to provide everything that they need so that they can do what they do for us. Best Management Practices is not just a way of cultivating that takes the environmental impact of the cultivation into consideration: it also places your personal attitude of working with the plants into importance. It’s about creating a place, or sanctuary, where the plants can thrive. Harlequin’s story is rooted in the idea of being humbled by working with medicinal plants. That meant learning to listen to what they need because they do all the work. In 2007, after 10 years of cultivating cannabis under Prop. 215 guidelines, Wade established such a relationship with the plants that he talked to them daily, calling them his “girls.” He would make sure to spend time with them, feed them the right food, create soil they would be comfortable in, and bathe them in nourishing water. I realized cannabis plants evolved in the earth and they need a connection to the earth, but growing indoor that was not a possibility. So he developed a system to deliver the same electromagnetic frequency that earth would emit of 7.83 Hz. His experiment began by taking seven identical plants and grounding four of them with a copper wire system that delivered “ground” to plants that were isolated from the ground. The four “grounded” plants began growing faster than the others, exhibiting traits the others did not have and producing flowers that doubled in size. These special seven plants were all Harlequin; a name Wade later gave them. These early Harlequin plants were a sativa-dominant strain that is now renowned for her reliable expression of the cannabinoid known as CBD. Harlequin got Wade’s attention right away for her rainbow-like display of colors and happy leaves (when grounded), thus the name “Harlequin”. 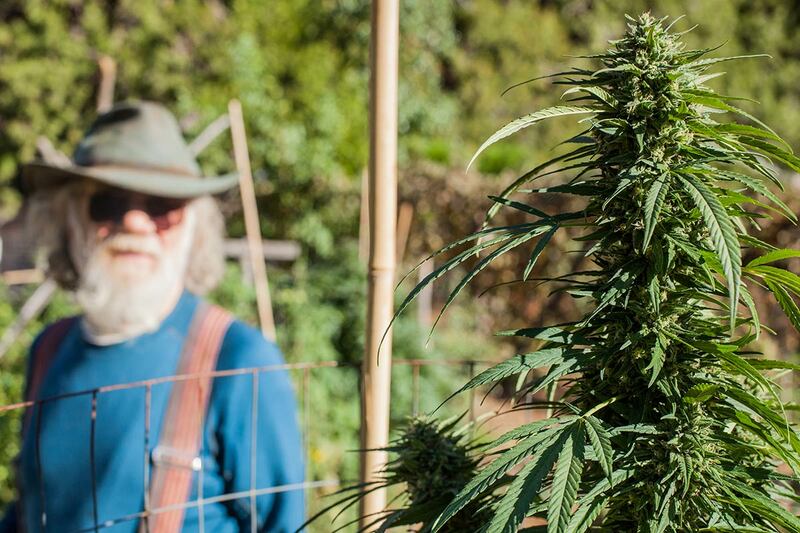 He harvested the flowers, cured them and offered them to his medical cannabis collective members. “Patients loved everything about it, but it wasn’t getting people stoned,” he said. However, one patient in particular gave a review that got Wade’s attention. He was medicating for pain in his reconstructed shoulder and although Harlequin did not give him the psychoactive effects that he was used to, the pain in his shoulder totally stopped. Among the 14,000 samples of cannabis product Steep Hill had ever tested up to that time, only a dozen contained CBD above 4 percent. The only live plant samples in that dozen came from three strains: Jamaican Lion, Omrita and Harlequin –all from the San Francisco Bay area. In spite of this amazing discovery, Wade quickly ran into some challenges: most dispensary employees didn’t know anything about CBD at the time, and most people who were looking for and needing CBD did not want to smoke it. So Wade teamed up with the co-founders of Project CBD, Fred Gardner and Martin A. Lee, to educate the public about CBD and the potential in the plant. Today, Project CBD is an established California-based nonprofit that promotes and publicizes research into the medical uses of CBD and other components of the cannabis plant. The organization educates physicians, patients, industry professionals, and the general public. Project CBD and its founders believe that the reintroduction of CBD-rich cannabis into the grassroots supply in Northern California in 2009 has given doctors and patients a unique opportunity to evaluate the effects of cannabidiol (CBD). In sum, Wade’s decades-long and insatiable thirst for knowledge has fueled his passion for research into the cannabis field. In addition to cultivation methods, he is interested in how patients benefit from cannabis that has THC and CBD in it. Branding & Website: Kurrent Design Co.